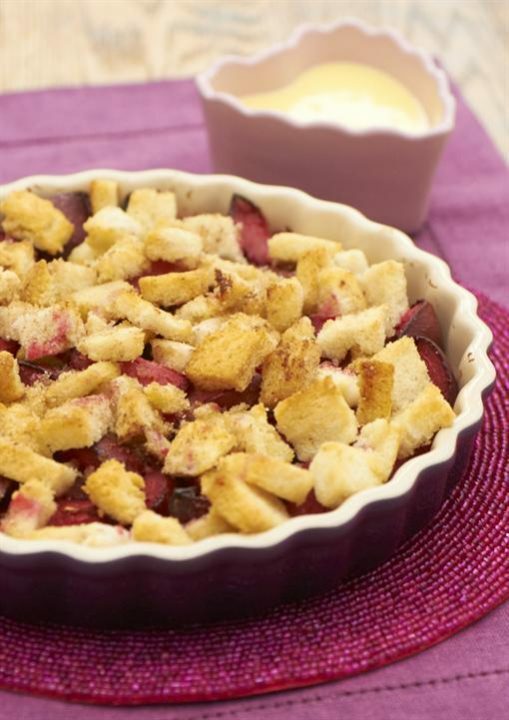 Prep 10 mins Baking 25-30 mins Just a few slices of bread can be turned into a crisp and sugary crust over tart plums. This works just as well with any fruit, especially apples. Set the oven to 200c, 180c fan, gas 6. Cut the plums in half, remove the stones then cut the plums into slices. Meanwhile cut the bread into 2cm cubes (discarding the crusts if liked) Melt the butter in a frying pan, add the bread and toss to coat it in the butter. Remove from the heat and scatter the bread over the plums. Sprinkle with Demerara sugar and cinnamon and return to the oven for a further 15 mins or until the bread is golden and crisp.